"I saw the John Carpenter film The Thing for the first time recently. That wasn't one of the VHS tapes they gave us, back then, to watch on the base. For obvious reasons. That's not what it was like for me at all. That doesn't capture it at all. They, or it, or whatever, were not thing-y. They are inhuman. But this is only my dream of them, I think." Two men, alone together on an Antarctic research base. A killer. A sceptic. Alone for months on end. Separated by what they believe. Joined together by Fermi's Paradox. Are we, indeed, alone in the Universe? Could it be that we are not alone but that we cannot know it? Could we deal with the horror of either answer? Crossing the boundaries of time and space, the many threads of The Thing Itself weave both a terrifying adventure and a mind-blowing philosophical conundrum, reaffirming Adam Roberts' unique place in the SF canon. Sound familiar? Well, it is—for a fraction of a chapter. Would you be surprised if I were to tell you that The Thing Itself is not—not even nearly—what it appears to be? If you answered yes to that question, I'd be given to guess you've never read an Adam Roberts novel. If you had, you'd know that this is not an author who likes to linger on any one thing for long, so though the first chapter has a handful of callbacks to John Carpenter's tentacular classic, the second is a short travelogue of sorts set in Germany almost a century earlier. "Let me pick the threads of this story up again, rearrange the letters into a new form," (p.48) the next bit begins—which sentence, I'll confess, had me panicking preemptively at the prospect of a new narrative in every chapter. 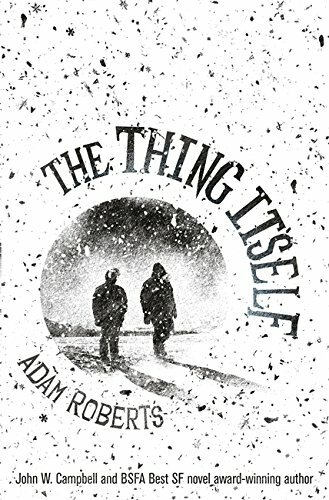 But although Roberts does repeatedly rewrite the rules of the tale he's telling, The Thing Itself is an easier and more coherent read than it appears. Which isn't to say it's simple. Why now? Because while we mere mortals mightn't be able to "step outside" our perception of the universe in terms of space and time, perhaps the kind of AI we're this close to creating today can; AI like the 438 Petaflop JCO Supercomputer. That's Peta to you and me, readers, and to The Thing Itself's protagonist, Charles Gardner: one of the two scientists the story started with. The other, Roy Curtius, is effectively the narrative's antagonist. After attempting to kill his colleague back in the Antarctic, Roy has been bound to Broadmoor, a high-security psychiatric hospital. Charles, on the other hand, still has his sanity, however he too lost more than a few fingers in the aforementioned fracas: he lost his confidence; then his sobriety; then his job; then the closest thing he ever had to a partner. It's only when he's called upon by a government-funded group known only as the Institute to assist in exploring the same subject that drove Roy round the proverbial bend—applied Kant, of course—that the downward spiral Charles has been circumnavigating since the incident dead-ends. As it transpires, Charles' continuing happiness is conditional on a confrontation the Institute insists on, because without Roy's input, its ambitious initiative is going nowhere. That's the thrust of the first third of The Thing Itself, but as I mentioned earlier, every other section steps outside of the core story. Happily, there is a pattern to these chapters. I had an idea what it was early on—that Roberts was treating us to the experiences of the people over the years who have seen behind the veil of space and time—but I was wrong; the explanation at the end of the entire contextualises The Thing Itself's handful of interludes in a quite different light. Frustrating as many might find it, unpicking this particular puzzle was, for me at least, an unfettered pleasure, largely because each interlude essentially stands as a short story in itself—two of which have been published independently in the past—and the author's faculty for that form is as all-encompassing as his deservedly-vaunted abilities as a novelist. Like Bête before it, The Thing Itself describes a deep-dive into philosophical thought punctuated by a rush of science-fictional stuff. In addition to an articulation of artificial intelligence approaching Kim Stanley Robinson's in Aurora, Roberts' works his way through a swathe of other subjects, such as the existence of extraterrestrials, remote viewing, space travel, temporal transit, and last but not least, life after death. I never imagined I'd find myself so readily recommending a novel "about why you should believe in God," (p.358) but by the end of The Thing Itself, Roberts—an atheist, according to the Acknowledgements—has so perfectly framed his case that I—another non-believer, I fear—came away from it with my spiritual convictions variously shaken. No phrase of the praise I would happily heap upon the remarkable achievement this tremendous text represents could outstrip that there statement, so let's call it a day, eh? Except to say that though The Thing Itself is many things, all of the things The Thing Itself is are evidence of Adam Roberts' inimitable brilliance.